Introduction: When Sony intr oduced their original NR70V, they caused somewhat of a sensation in the PDA world -- it featured an innovative "Flip-and-Rotate" design, a gorgeous half-VGA color screen with "virtual Graffiti", a mini-keyboard, a camera and MP3 playback. The second-generation NX70V is significantly enhanced with a powerful ARM-architecture processor running Palm OS5, an improved camera, optional WiFi wireless capabilities and numerous other refinements. The host of advanced capabilities merit calling this high-end device a "Personal Entertainment Organizer". Design: The Sony Design Group has crafted some truly iconic consumer electronic designs and the NR-series is a good potential candidate. Why mess with a good thing? The NX70V is housed in an elegant cast magnesium case with a textured silver finish. (A limited edition "Gunmetal Grey" version sold out very quickly.) It looks very high-tech, and seems very durable. There are 2 main components, the screen and the base, which are joined by a hinge and a swivel. This allows three basic forms. - When closed, the screen's metal back is exposed, forming what amounts to a built-in metal case. - Unfolding the screen section reveals the large display and the mini-keyboard and buttons on the base beneath. In this clamshell form, the base can be held in two hands for thumb-typing, but it feels kind of top-heavy with the screen projecting out. The keyboard itself is made of a grid of circular, very low-profile keys. They are close together and have a layout that you have to get familiar with. It is worth learning though, because it is much less tiring than Graffiti for longer text input. Above the keyboard lie the four application and up/down scroll buttons. - The screen is swivelled 180 degrees and folded back down to cover the keyboard. This is the more conventional tablet form, which presents the full screen area with Virtual Graffiti. It's really nice, and many users will find this to be their preferred mode of use. The stylus remove towards bottom which takes a little getting used to. The lack of application/scroll buttons in this mode is a potential drawback. Along the left side of the base are the JogDial, Back button and Hold switch. Above these lies the stereo headphone jack which supports a standard 3.5mm plug . It would be nice to move this jack to the other side so that the other controls could move up to a more comfortable position. A Capture/Rec button on left hinge axis. The top of the base is straddled by the arms of the hinge, This area contains the rotating camera lens; the Power button (with a bi-color LED that indicates charging status); and a Recording indicator LED. On top are the Memory Stick slot and IrDA/remote window. Most obvious external difference from the NR is the bulge on the rear of the device to accomodate the "wireless expansion slot" (aka CF slot). It is shaped to fit in the hand nicely but adds to depth, making a device that is already on the largish side a little more bulky. A speaker is on back, which is reasonably loud for its small size and the Clie Standard Interface connector is on the bottom. The cradle for the NX matches the handheld perfectly; with a frame of same magnesium alloy and a transparent center insert. Its laid-back style has a big footprint, which is probably necessary - in clamshell mode it would tip over otherwise. A USB cable is fixed to the cradle, but there is a power plug which can be used with the included plug adapter for travel without the cradle. Nice touch. The NX comes with a pair of basic "earbud"-type headphones and a wired remote first featured with the N760C (the first MP3-capable "Palm"). It is a convenient accessory which allows control of volume; play/pause; skip; hold for music player and movie player applications. Oh, and as has become a standard feature on Clies, there is also a nylon wrist-strap which can be attached to a point on the right hinge axis. Overall, it's a very nice package. Hardware: Outwardly, the NX70V looks quite similar to its older sibling, but there are a lot of changes "under the hood". For it's first OS5 device, Sony selected Intel's 200 MHz XScale PXA-250 ARM-processor paired with NeoMagic DSP for multimedia, CF handling and other companion chips. The increased horsepower of the processor in combination with the enhanced capabilities of Palm OS5 allow the potential to be realized. Although the "Palm OS Ready" XScale has sophisticated power management for processor operations, there are many other power-hungry components. The NX70V has 16MB flash ROM for the Operating System and preinstalled applications and 16MB of RAM, of which only 11MB are available to the user. Memory Stick (MS) removable media is required for music playback and video capture. The MS will have driver upgrade to support the larger capacity and faster MSpro and is IO-compatible for use with the Bluetooth MSIO card. The screen is a 320x480 pixel, 16-bit color transflective display, with back-lighting. It is very bright, has good color balance, and no "grid lines". It is a big, sharp display area and is essentially the current state of the art. It is very viewable (and much more power efficient) when set to lower brightness settings. The rotating camera uses a 310k pixel CMOS sensor to capture images four times the resolution (640x480 VGA) of the NR-series camera. It can also capture small sized movies (160x112) with audio. Although the quality isn't the highest, it's a fairly useful tool - if you carry your PDA a lot, you have lots of opportunities to "capture the moment". If you need print quality, you might want to check the 2MP CCD capabilities of the new NX90. If you aren't interested in capturing images at all, the NX60 model is identical to the NX70V except that it doesn't have the camera. Here are a few sample images taken with the camera. Click on the thumbnail to see the full-size (640x480) image. The Audio capabilities are great, with a good recording the included headphones sound fine. Higher quality headphones provide *great* sound. :-) The speaker provides decently loud volume for alarms and listening to voice memos recorded with the built-in mic. The NX supports audible alarms through the speaker and blinking LED alerts, but no vibration alert is included. Power is supplied by a rechargeable lithium ion polymer (LiIon Poly) battery, nominally rated at 900mAh. Claimed battery life is 10 days under "typical" usage scenario: (30 minutes/day with backlight off). Measured powered consumption with backlight off was 115mA; with light from dimmest to brightest: 140-220mA; and when recording a movie to Memory Stick, up to 370mA. Heavy users should get through the day pretty easliy ;-) Recharge time in the included USB HotSync cradle is 3-4 hours for a fully discharged battery. The NX70V supports a variety of connectivity options: WiFi, of course, is possible with the optional WL100. The standard Sony 20-pin Interface Connector (for USB and serial) also supports the GC10 Game Controller, but disappointingly, not the KB11 Compact Keyboard. The MSB1 Bluetooth Card can be used in the Memory Stick slot, and beaming is avaiable via IrDA. Size & Weight: 5.4" x 2.8" x 0.6-0.9"; 8.0 oz. 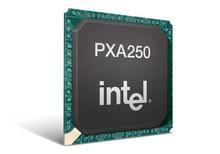 Software: The NX-series is the first Clie to use Palm OS5 on the more powerful ARM processors. This speeds up many applications, and most software seems very "snappy". The majority of pre-OS5 applications are properly written, and typically just work, while an increasing number of applications are being released which take advantage of the power of OS5/ARM. Sony has made some enhancements to the User Interface, most notably with the Virtual Graffiti area. There is almost universal appreciation for the way Graffiti strokes are displayed as they are made -- it provides great feedback. It can be toggled to Keyboard mode (with alpha, international and numeric layouts) as well as to optional Silk Plug-ins which can show tools such as a calendar display, calculator, etc. in the bottom third of the screen while the main area shows the running application. The bottom of the display has a persistent Status Bar with buttons for Launcher, Menu, Find and Silk Plug-in; indicators for Battery level, Memory Stick, System Volume, Time, and a Silkscreen Collapse button to show more of the application. When this was introduced on the NR-series, the only Collapsable application was PhotoStand. One of the most welcome changes on the NX is that most of the bundled applications support this feature. The ROM is preloaded with the core set of Palm OS PIM (Address, Date Book, Memo Pad, ToDo List, Calculator) and System applications (Card Info, HotSync, Preferences (with HiRes and Jog extensions), Security) but the NX includes a host of additional programs. 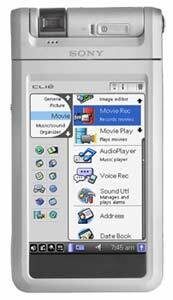 For imaging: Clie Camera: - capture up to 640x480 JPEG images; Photo Editor - for adding notes to images; Clie Album - sort and present your images; PhotoStand - displays photos with an optional clock overlay; Movie Recorder - 160x112 MPEG movies with audio (at about 2MB / min); Movie Player - for playback of MPEG1 and MPEG 4; Cross-application integration through Clie Viewer, which lists and allows opening of images, movies, notes, voice recordings; and provides multiple options for opening in a related application, including sending the file as a Clie Mail attachment. An updated version of Audio Player is provided for listening to either MP3 or ATRAC3 music files. It is skinnable, offers full screen support, has three levels of "Bass Boost" (no graphic EQ yet though) and loses the visualization feature in favor of the much more useful playlist sorting. A copy of Macromedia's Flash 5 is included along with a couple samples, but for a real treat, load up Tricorder and check it out. Another exclusive is Clie RMC, which allows remote control of various home entertainment components. Full versions of DataViz Documents To Go (Standard) for MS Office view and edits; StreetFinder Express mapping software; and PowerOne Personal calculator are included as well as a broad range of trial-version applications (see the NX website for the full list). Also on the CD are Palm Desktop 4.0.1 for Windows, as well as Intellisync Lite for syncing with MS Outlook and Lotus Organizer. Mac users can use Missing Sync. Other bundled applications are included for transferring multimedia files between the Clie and the PC: Image Converter and PictureGear Studio for image and movie syncronizing; Sonic Stage for ATRAC3 music file creation and transfer; Sound Converter for alarm creation; MS Export for transferring files; and GigaPocket, which (if I understand correctly) allows export of Vaio DVR software recordings. (!). The CD also includes on-line manuals: Handbook (pdf) and Applications Manual (html) - people who are overwhelmed with the broad array of supplied applications are well-advised to refer to this ;-). Wireless: Wireless LANs based on the 802.11b specification (a.k.a. "WiFi") have become an increasingly popular and widespread method of Internet access over the last few years. The HandEra 330 supports WiFi CF cards, and several WiFi "sleds" for other Palm OS handhelds have been developed. With Sony's WL100 CF card (a $150 optional accessory), the NX70V can also take advantage of this form of wireless connectivity. Once inserted, the card projects out of the top of the handheld by about 3/4". It would have been nice if it had a lower profile, but it's not too obtrusive. 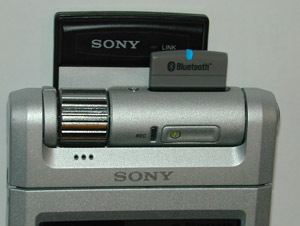 Although the Memory Stick slot is accessible with the WL100 installed, the camera lens is partially blocked if aimed to the back. Setup is relatively straight forward: after syncing a single 114KB driver file, Network Preferences can be configured for connection to WiFi Access Points. Both 40-bit and 128-bit WEP encryption are supported, and multiple profiles for connection to different Wireless LANs can be configured. Once connected, a green "Link" LED on the card blinks to show data transmission activity. For Internet applications, the NX70V comes with NetFront web browser and Clie Mail email client, both of which work very nicely over WiFi. Third party communication apps like VeriChat and upIRC are also intriguing uses when the Clie is docked at your workstation as a messaging window..
Power consumption is specified as 105-185 mA when transmitting (depending on signal strength) and 18mA when idle. This means that there are definite limits to surfing time. Because the NX70V has a non-removable battery, a supplemental power source (such as the PEGA-BC10) might be worth considering. In testing, I had great range to my WiFi Access Point (a Sony PCWA-A100) even with a fairly "noisy" environment (2.4 GHz cordless phones and Bluetooth). Market Positioning: Ever since they entered the market with the humble S300, Sony has been calling their line of devices "Personal Entertainment Organizers". In less than three years, their high-end devices have evolved to become powerful networked multimedia devices. The amusement potential is great, and has the potential to get a lot greater seeing as Sony is exploring the home entertainment network in many of their product lines. Although marketed with an "Entertainment" focus, the fact that these are also powerful portable computers shouldn't be overlooked. Currently, the NX70V ($600) sits in the middle of the range, with the NZ90 ($800) on one side, and the camera-less NX60 ($500) on the other. Even if the high-end devices aren't the top sellers, the Clie NZ- and NX-series enhance Sony's reputation for leading edge audio/video/wireless and influence the consumers regard for the brand, and likely influence sales of their more affordable lines. So where does the top-end Clie line go from here? The same design path, but further feature enhancement and size increases (a PictureBook micro-laptop running Palm OS one day)? A possibility of the often-hoped-for 320x480 OS5/ARM standard tablet form? It will surely be entertaining to keep tracking this segment of the Clie product line. Summary: The NX70V is a feature-packed high-end multimedia device that delivers on the promise of the NR-series. It is a powerful OS5/ARM device with WiFi wireless connectivity options. Its a very compelling device for people who really appreciate high-quality high-tech. The Clie NX70V is available now from SonyStyle for $599 USD. PIC is on a roll. Nice job! 1. Goto Best Buy - pick up WL100 WiFi card for $100 after $50 rebate). 2. Install drivers off CD. 4. Under "Preferences | Network", set service to "Wireless LAN". 6. Click on "Create" or "Edit" to create/edit new profile. 7. Enter ProfileName (just a label), SSID, WEP, Key, ConnectMode (set to Infrastructure for LAN based WiFi network). 8. Click on "OK", then "OK" again. When you go to use CLIE Mail or NetFront, and an IP request is made, up pops the connection dialog. Only problem is that I have different profiles for work, home, and roaming, and you need to go in and change which connection you are using via the Preferences app. Very cool usage is Wireles Hotsync - but only to device, Wireless Hotsync to MemStick no go. I love the NX70V (esecially with the WL100 WiFi card). I was looking at the Tungsten|T, and seriously considerd the Kyocera 7135 and the Tungsten|W, but when it comes down to it, most of my wireless needs are within reach of a hotspot (hence decision to go WiFi rather than GPRS/1xRTT) and I fell in love with Virtual Grafitti area. NX60 would have been a great option too - but the camera is a nice "toy" to have as well. I have the same annoyance. I WISH someone would develop what I believe would be a very simple program to "Schedule Profiles." For example, I am at school (with WEP-free Wi-Fi) from 7:00am-3:00pm MTWThF. I am at home (with a locked-down, WEP enabled Wi-Fi) in the evenings and on the weekends. I want to input this schedule into the Clie and have it automatically switch between my "Home" and "ASU" profiles at the appropriate times. How hard can this be to develop? PS I want the same little utility on my phone--- to schedule my Loud, Normal, and Silent (school) ring profiles. ... relatively easy, all the info needed is in the systems database. I might give that a try this weekend as an app attached to a "button" for WonderSilk. DA's and Hacks are kinda hit and miss under OS5, but an app is definately doable. Keep an eye out on cliesource.com, if it works I'll announce there. Actually, this is an easier implementation than what I was actually looking into - a rollover program that would try one profile, fail, try the next, etc until a successful connection was established. "......we suggest that you wait before you rush out and buy new 802.11g products, especially considering that the Institute of Electrical and Electronics Engineers (IEEE) has yet (June 2003) to even ratify the new standard." "The IEEE P802.11g draft had technical changes made to it at the January 2003 session, and further changes are expected starting in March 2003 based on comments received from the sponsor organization of IEEE 802.11," Brian Mathews, IEEE 802.11 publicity chair, said in a statement. He added, "The only sure way to guarantee compliance and avoid potential interoperability problems is to wait for final ratification of 802.11g, which is highly likely in June 2003." The 802.11g specification was updated to version 6.1 in January and the IEEE is expected to update the draft to version 7.0 in March. Shoemake added that the changes between versions 5.0 and 6.1 of the 802.11g specification were significant enough that they were "noninteroperable." Wi-Fi Alliance sets July as tenative date for 802.11g interoperability testing: News.com reports that products certified as interoperable with the 802.11g could be on shelves as soon as August. Just to emphasize the above comments regarding "G". I returned by Linksys G and got a plain old 802.11B. Works well. Where are the 128 + sticks? Anyone know where I can download flash files? Anyone know where I can download flash files? I want them for my clie nx-70. RE: Anyone know where I can download flash files? Man, the picture quality in NX70 sux big time. Hellz. - l33t 4ll th3 w4y. Well, it is only .33 megapixels! of course the quality won't be that good! It's just a toy and a fun feature but if you want quality get a digital camera! I hope there will soon be an enhanced NX-70 which would have a black NX enclosure, plus built-in Bluetooth, plus the enhanced backlit keyboard of the TG-50. FAIC, the camera can remain VGA. Wouldn't mind 32 Kb of RAM though. Anyone happen to know if such a device is coming? Anyone with experience of using the Starbuck/Tmobile wireless service? I have Tungsten C and I use at Hotspot locations with no problem. Literally no hassle setup. So how do you get past the Starbucks/Tmobile pages? When I go to my browser at Starbucks, I get the starbucks home page. When I try to sign on to Tmobile, I get their page. What I want is my Yahoo page. By contrast, shen I connect at an AT&T hotspot, I instantaneously get the Palm WAP home page with a link to Yahoo. I've paid my Tmobile account, but can't seem to get to the material I really want. Am I missing something? You said that "The NX comes with a pair of basic "earbud"-type headphones and a wired remote first featured with the N760C (the first MP3-capable "Palm"). I used to own a N710C. 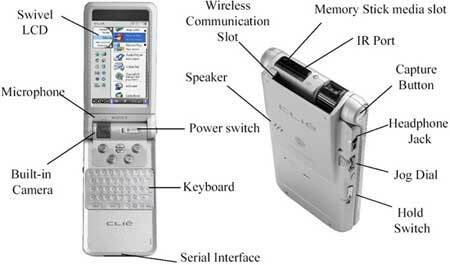 This model preceded the N760C and definitely was MP3 capable. In fact, it also included the same wired remote. See http://sonyelectronics.sonystyle.com/micros/clie/models/710.html . My bad: I should have said the N710/N760 -- for all intents and purposes they were the same device, just a difference in the OS, and the N710 was transitioned to the N760 as soon as OS4.1 was available. just got the nx70v, any tips on loading avantgo would be much appreciated? I am about to buy an NX70V and I had a few questions. Do all applications work with the 320x480 high res screen? If not, which ones? How will I know? HI. I have the Sony NX70V and was wondering how the wireless network actaully works. When you have the software installed on the palm and the Wireless card inserted, do you walk around unitl you find a hotspot with a wireless connection? Do i have to sign up for anything? how much does it cost per month? Are some hotspot areas free? how do i know when i've entered a hotspot? your responses are greatly appreciated! You need to configure the WiFi card once loaded through the Prefs>Network>Service options. Then fire up NetFront or Clie mail. I have used my NX70V to check emails in Airports in Denmark and Belguim, but have to pay a fee to access the hotpoints. WHY DOES THE REVIEW COME SO LATE? If you want to do it, do it when it came out. You may as well review the 1992 all new Camry now. Throughout the review you keep mentioning the Wifi CF card, does CF in this case stand for compact flash?